The 1949 Queen Charlotte Islands earthquake struck the sparsely populated Queen Charlotte Islands and the Pacific Northwest coast at 8:01 p.m. PDT on August 21. The shock had a surface wave magnitude of 8.1 and a maximum Mercalli Intensity of VIII (Severe). The interplate earthquake began in the ocean bottom just off the rugged coast of Graham Island. It ruptured along the Queen Charlotte Fault both northward and southward more than 500 km (311 mi). Shaking was felt throughout British Columbia, parts of Washington, Oregon, Alberta, the Yukon, and Alaska. No deaths were reported in this earthquake. The 1949 Queen Charlotte Islands earthquake was caused by a rupture on the Queen Charlotte Fault, which forms part of the boundary between the Pacific and North American plates. This fault runs from northern Vancouver Island, west of the Queen Charlotte Islands, up to the Gulf of Alaska. The earthquake ruptured the fault for a distance more than 500 km (311 mi). Because this quake occurred before the modern surface wave magnitude scale was developed and widely implemented, this earthquake may have only had the same overall intensity as the 2012 Haida Gwaii earthquake. In future there may be some research done to compare the two earthquake events. This earthquake, larger than the 1906 San Francisco earthquake, is Canada's largest earthquake recorded by seismometers. 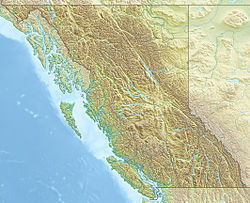 However, the greatest earthquake in Canadian history was the 1700 Cascadia earthquake, a megathrust earthquake that occurred along the Pacific Northwest coast from Northern California to southwestern British Columbia which reached magnitude 9 on the Richter magnitude scale. Although nobody was killed in this earthquake, people and animals were knocked off their feet and there were landslides and other damage. Chimneys tumbled, and an oil tank at Cumshewa Inlet collapsed. In the service community of Terrace, away on the mainland, cars were bounced around, and standing on the street was described as "like being on the heaving deck of a ship at sea". In the port city of Prince Rupert, windows were destroyed and buildings swung. This page was last edited on 16 February 2019, at 04:47 (UTC).